With every new boiler installation, a power flush is highly recommended by the manufacturer to validate the warranty of the new boiler. In addition, this decreases the chance of build up of sludge and debris in the system which goes through the boiler. 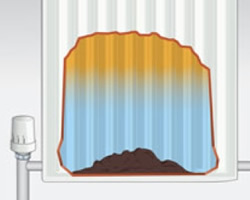 Without a power flush, all of the old dirt and sludge will flow through the system into the new boiler increasing the chances of breakdowns and future problems. When carried out properly, it can be an all day event. 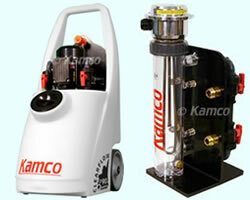 First each radiator is opened fully on the valves at each end to allow maximum flow as this is when the Kamco CF90 Clearflow Quantum works at its best. Once the water is circulating the cleansing chemicals are then added and flushed through one radiator at a time, reversing the flow backwards and forwards to create maximum effect shifting the deposits that are sitting in the bottom of the radiators. Rubber mallets and other equipment can be used to cause vibrations in each radiator again to shift any deposits. After every radiator has been flushed with the chemicals the process then repeats but instead the cleansing chemicals and sludge is removed and dumped out of the system and machine and fresh mains water is added until the water that is being dumped out becomes as clean as the water going in. When the process has been completed the machine in switched off and system inhibitors are added to protect the central heating system from future build up of corrosion and sludge. Not only is this beneficial for new boiler installations, but this could also improve the reliability of your current central heating system as it allows the water to flow through the system better with cleaner water to increase efficiency.